It is my favorite night of the whole year. We go all out for Christmas Eve. The theme, the games, the crafts, the fondu dinner (at which Chick-Fil-A chicken nuggets make an appearance), the devotion, and of course, the carols. I love it all, but I especially love that moment at the end where we are all crammed in one room singing carols. The group grows every year, significant others, spouses, and friends adding to the family friends I’ve grown up with. 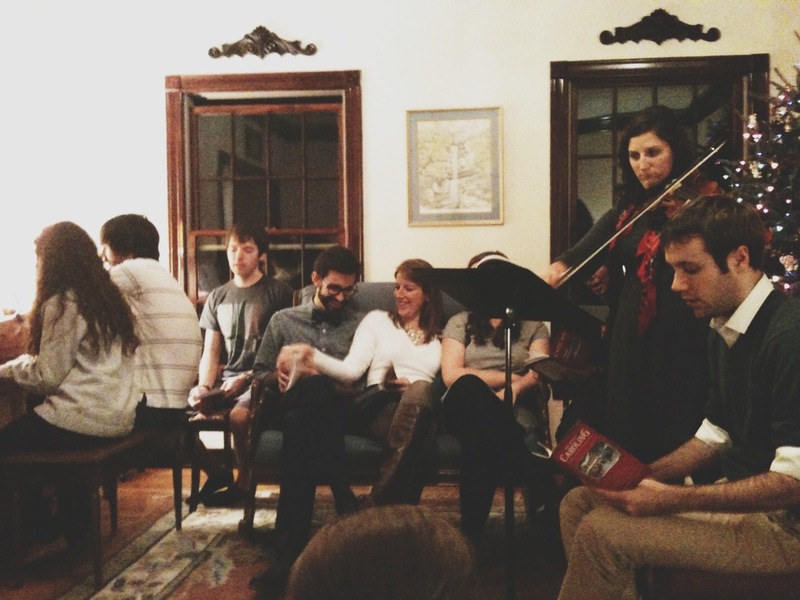 We sing our way through the carol books, insisting on almost all the verses of every song we sing. First the sacred ones, the holy ones, and then the jolly secular ones that have worked their way in. We always end the same way, with a darkened house, the final candle lit on the Advent wreath, and “Silent Night” sung out to finish the evening. 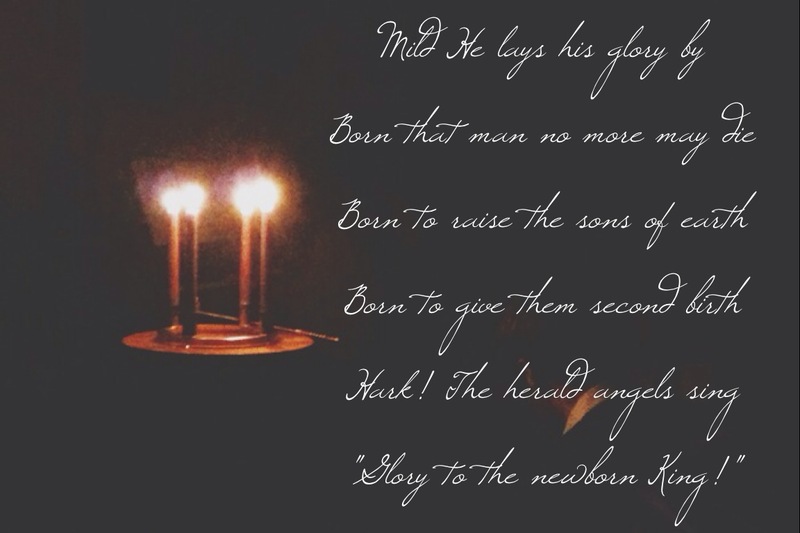 Have you ever actually paid attention to the words in those old carols? They are beautiful words, old words that we don’t say anymore. They hum against your ears and sound foreign yet familiar. Carols are the poetry of Christmas. We spent 36 hours in Kentucky last weekend, squeezing in the annual Christmas Eve party, albeit a couple days early. It meant a lot of driving and very little sleep, but it also meant having the whole family together briefly to celebrate. It meant getting to sing the carols I love with the people I love. Yesterday we piled back in the car and headed up to spend the week with James’ family in Indiana. All the way there we played this song, not exactly a carol, but still a song that captures the poetry of Christmas. PS: Would someone artsy please open an Etsy shop with cool prints that feature beautiful passages from Christmas carols? I searched for some in writing this and there is, other than some snatches of “Oh Holy Night,” almost nothing. I would totally hang them in my house during Christmas… or all the time. This entry was posted in Uncategorized and tagged Christmas, music, traditions. Bookmark the permalink. Oh she does have some pretty ones! Still not tons, but more than anywhere else I’ve seen! I think I love the entirety of “I Heard the Bells on Christmas Day,” which was a poem to start with, conveniently enough. I love that the speaker sees the darkness, but even though he’s discouraged, he reminds himself, yes, peace on earth, goodwill toward men. As far as Elf goes, I love saying, “IS THERE SUGAR IN SYRUP? !” because I have an enormous sweet tooth. That’s a good one all year round. And have you heard Straight No Chaser’s “Twelve Days of Christmas”? I love it so. I lovvveeeee that song!!! My brothers and I have always been obsessed with the Toto Africa song so I love when it turns up anywhere! We love that movie too and with lots of grankids over all the time, we get to watch it year round !! Our youngest grandson loves any scene that someone makes loud obnoxious noises !! It is a great movie and has a lot of great lines in it !! Just a sweet fun movie !!! ‘have yourself a merry litte christmas, let your heart be light… ” will always be my all time favorite christmas lyric..
p.s. chick-fil-a nuggets are essential to the holidays. I will definitely be checking out her shop when she gets back! Thanks! I might just have to get ambitious and do that!